JANINE, A COELHA, SEMPRE TOMAVA CONTA DAS CRIANÇAS DO BOSQUE. OS PAIS DEIXAVAM SEUS FILHOTES COM ELA DURANTE A TARDE. JANINE SABIA CONTAR HISTÓRIAS, DESENHAR E CANTAR COMO NINGUÉM. MELHOR AINDA, NÃO EXISTIA OUTRO IGUAL NA HORA DE PREPARAR OS BISCOITOS DOURADOS QUE OS PEQUENOS ADORAVAM. QUANTOS ANIMAIS, QUE SE TORNARAM ADULTOS, NÃO SE LEMBRAVAM COM PRAZER DA INFÂNCIA E DOS FABULOSOS BISCOITOS DA JANINE! 3) QUAL É O PERSONAGEM DA HISTÓRIA? 4) O QUE FAZIA JANINE? 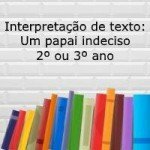 5) O QUE JANINE FAZIA COM AS CRIANÇAS? 6) O QUE AS CRIANÇAS MAIS GOSTAVAM DE FAZER QUANDO ESTAVAM COM JANINE?